Wine Room mural painted on canvas in the studio and executed in artist’s acrylics. Careful use of structured perspective helps create the illusion of added depth. 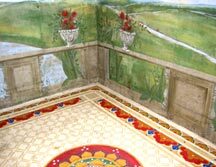 Selected floor color, design and stencils can be attributed to both Chinese and Assyrian (1817-94) Ornamental influence. Example of hand painted walls influenced by 18th century Chinese chinoiserie. Additional depth of perspective was achieved by incorporating and blending the outside cement surface wall into the inside composition. Mural painted directly upon walls using nature studies from private sketchbooks. Reminiscent of a Degas pastel, this tree mural captures the reflective color and brush strokes of the Impressionist Artist. Architectural egg and dart elements enhance this hand painted sky mural. This mural required eight panels to complete the illusion of an outdoor park. Wall mounted crystal sconces float as if suspended in space. Antique references were used and combined to create this unique decorative ceiling mural. The illusion of depth and expanded space is achieved by having clouds and birds painted directly upon this ceiling. 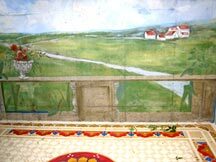 This mural was inspired by classical architecture and was painted directly upon the wall using artist’s acrylics. Painting the mural in the corner adds depth to the room. Rich jewel colors enhance this quaint Tuscany themed mural. Tiles are to be set in place on a wall above the stove area.